It’s the week of the Super Bowl and we are dedicated to brining you Super Bowl inspired recipes! We’ll be bringing you some old recipes and a ton of new recipes to make your Super Bowl parties super incredible and filled with tasty food. Our first recipe is one of the first recipes we ever posted and our first experience with fried food. We thought frying food was really intimidating but once you do it one or two times, it’s really is not that scary or hard. But we do recommending having a thermometer to know the temperature of your oil. It really truly helps. And just remember, every time you put something in the oil the oil temperature will drop. So, in between batches wait for your oil to reheat. Fried pickles are the perfect way to start off your super bowl party. Who doesn’t love pickles? 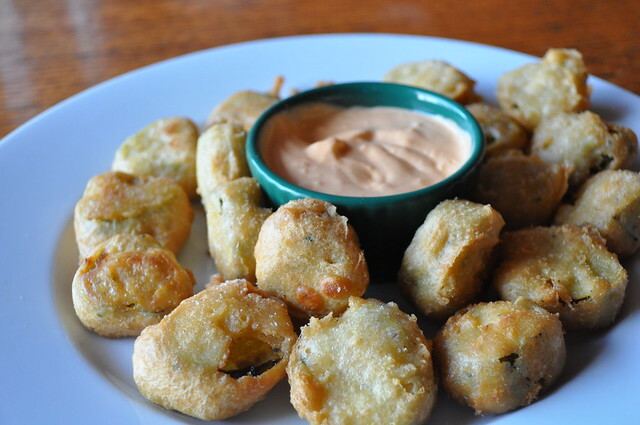 They’re tangy, they’re crunchy, they’re salty, and fried pickles are the perfect finger food. These are a must at all of our get togethers. So get on the pickle train, because it’s leaving for flavor town…wow that was incredibly awkward to write, I’m embarrassed. Click below for our scrumptious fried pickle recipe and save me from myself. One thing about us is we love TV shows. I mean, we went to film school so while others watch shows and movies passively we LOVE to watch and analyze and see things that other viewers might miss. And of of our favorite shows is Gilmore Girls, a few months ago we actually were lucky enough to test a recipe from the Unofficial Gilmore Girls Cookbook. We made Mock Turtle Soup and really enjoyed all the Gilmore Girls inspired recipes. We love signs and if this picture wasn’t a sign to make fried rice, I don’t know what is. What’s great about this recipe is that we think just about anyone could make it. Even the Lorelai’s and Rory’s of the world who fear the kitchen and all it’s tools, this recipe is pretty easy and almost impossible to mess up. While we made our own rice for the recipe you can totally use left over white rice that you get from Chinese restaurants that you usually have no idea what to do with days later. You can also utilize whatever frozen vegetables or left over meat you have in the fridge (beef, pork, chicken…yum). Forgive us, we just watched Mulan over the weekend and can’t stop singing all the songs. Anyway, this recipe is super easy and we think that even Lorelai Gilmore could make it with ease. And while ours is called vegetable fried rice, you can add just about any kind of meat you want. Or leave it as is. We think that Al from Al’s Pancake World would definitely approve. It’s January! A new year! And that means new recipes. And the best way to start out the new year is with a delicious sugar cookie. One of our favorite types of cookie is those perfectly large, round, sugar cookies you find in the bakery. For this recipe we actually doubled the original recipe so there would be more cookies to enjoy. You can certainly cut this recipe in half but if you want more cookies, we suggest going with the recipe as it’s written below. The lemon zest is also totally optional but we recommend leaving it in because it gives the cookies a little extra ‘something’. And if you have Meyer Lemons, that’s even better. You know how much we love our Meyer Lemons here. Get zesty! Also a fun fact about Sugar Cookies, they date back all the way to the 1700’s in Nazareth Pennsylvania, where German Protestant settlers created a round, buttery, cookie known as the Nazareth Cookie. This cookie actually became the ‘official’ cookie of the State of Pennsylvania. And then in the 1930’s sugar cookies gained popularity in America when children would leave them out for Santa as a midnight treat. Lucky Santa! Let us know how you enjoy these sugar cookies!